CFS began a 20,000 square foot expansion and facility revamp, investing $4 million into product and process improvements. Upon its completion, our shop now encompasses nearly 125,000 square feet of space and up to a 50-ton lifting capacity with up to 30 feet under the hook. Shop Operations is most known for manufacturing and machining parts for the Utility and Chemical Industry. Our shop works on a high concentration of parts especially within the Power Generation field. These parts can be very large and complex which are easily handled within our shop operations. Shop operations currently services over 100 customers and employees over 30 people. The AccuteX CNC Wire EDM EZ-53SA Series is a 3-Axis submersed straight cutting machine. Designed with Finite Element Analysis (FEA), it standard direct driving motor in X/Y axes with rigid body design, and high servo response is an smart economical choice for any shop. The ROBOFIL 440 CC fulfill the wishes of any wire EDM machine user â€“ to cut faster and obtain excellent accuracy while maintaining the mechanical and metallurgical properties of the cut surfaces. The CC spark generator achieves this performance, which ensures a considerable gain in productivity. CNC Toolroom Lathe; 16" x 30" (406 x 762 mm) max capacity, chip enclosure, 20" (508 mm) swing, 12 hp (8.9 kW) vector drive, 2000 rpm, A2-6 spindle, Intuitive Programming System, coolant pump, 1 MB program memory, memory lock keyswitch, air blow gun, 15" color LCD monitor and USB port. Horizontal Machining Center; 64" x 50" x 32" (1626 x 1270 x 813 mm), 50-taper geared-head, 30 hp (22.4 kW) vector drive, 10,000 rpm, 30+1 side-mount tool changer; includes 1 GB program memory, 15" color LCD monitor, USB port, memory lock keyswitch, rigid tapping, power-failure detection module and color remote jog handle. Includes enclosure, coolant system and chip augers. Vertical Machining Center; 50" x 26" x 25" (1270 x 660 x 635 mm), 50-taper geared-head, 30 hp (22.4 kW) vector drive, 7500 rpm,30+1 side-mount tool changer, 710 ipm (18 m/min) rapids, color remote jog handle, programmable coolant nozzle, automatic chip auger, power-failure detection module, 1 GB program memory, 15" color LCD monitor, USB port, memory lock keyswitch, rigid tapping and flood coolant system. The Johnford SDMC series is a heavy duty sliding double column machining center. With standard accessories, this heavy duty moving double column vertical machining center, starting at nearly 150,000 lbs. of Meehanite cast iron. The machine design features a moving column and fixed table for unlimited table loads. All You Ji YV Series vertical turning centers feature heavy Meehanite cast iron construction, choice of rigid roller type linear ways or rigid box ways, and large diameter pre-tensioned ballscrews. The YV series machines feature heavy duty spindles featuring double row roller bearings (Timken Cross Roller for YV-800) for rigidity and precision. High power spindle motors coupled with ZF planetary gearboxes (on most models) provide unparalleled torque for heavy metal removal. The VTL series machines are extremely robust and are suitable for even the most demanding applications. The VTL machines are available in 40â€�, 49â€�, 63â€�, 78â€�, 98â€�, 118â€�, 137â€�, 158â€� and 177â€� tables and feature a symmetrical base / column design with moveable cross rails in programmable 200mm increments. The VTL series is available in variable column heights / ram strokes to accommodate very tall workpieces. Twin rams are also available on the VTL-1600 size and larger machines. 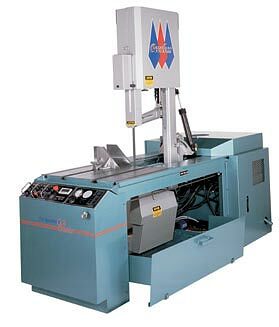 The large size VTL-3000 and larger machines are a double column design and the optional C axis features a dual spindle motor / dual pinion drive for the C axis, providing nearly zero backlash and the most accurate C axis positioning and repeatability available. Carlton has concentrated exclusively on radial drill, research, engineering and manufacturing since 1916. As a result of this single purpose, Carlton was the first radial drill manufacturer to bring you the low hung drive to spindle, all ball bearing construction, independent electric power for spindle and auxiliary components, push-button control, 3-unit power clamping, precision column clamping ... and finally, the pre-selector systems of speed-feed control. For more than 60 years, the Bridgeport Series I Standard Mill - the original, all-purpose mill - has been the "real thing" in milling, drilling, and boring for metalworking shops throughout the world. Today, the Series I Standard continues to fulfill the industry's need for an accurate, reliable, and versatile mill. With the H"nel Lean-Lift" we offer you a first-class, high-tech system for storage organization and materials handling that saves time, storage space and costs, and enables a much more efficient workflow.